Do your part! Be an active member of the SUNY Oneonta community! Become a Volunteer! Volunteers play a vital role in the success of the SUNY Oneonta Alumni Association. Sign up to become a volunteer and share your skills, experience and expertise! Please take a moment to peruse the volunteer opportunities below. We have options available, both on and off campus. For general inquiries about alumni volunteering, contact Danielle Tonner, Associate Director of the Office of Alumni Engagement, at 607-436-2526 or email us at alumni@oneonta.edu. Whether you would like to host an event near you or return to campus to help out with the many events we host each year, we are always seeking alumni like you to help us out! Class chairs and committee members are always needed in order to put together the biggest alumni party of the year. Maybe you just want to help out at on of the more than 30 events held throughout the weekend or be a welcoming face at Reunion Headquarters. Being a reunion volunteer is a great way to get involved and make sure you see all your friends. Write postcards to classmates or make phone calls to invite your friends to events. Still live near campus? The Office of Alumni Engagement can always use assistance with general administrative duties! Want to do your part from home? Become a Social Media Ambassador. Would you like to return to campus to share your wisdom and advice with current students? How about participating in a networking event? Are you available to host students in your place of business? Have an internship opportunity available? Find out how you can contribute to the future success of our SUNY Oneonta students. Were you a member of a student group or sport that meant a lot to you as a student? We can help you organize an event to gather your friends or rekindle lost friendships. on alumni issues, programming and events, career services and much more. Find out more, or to nominate yourself or a friend for the Alumni Association Board of Directors. 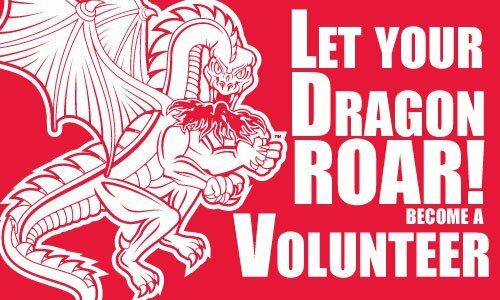 Sign up now to become a volunteer and take one more step towards becoming a LOYAL RED DRAGON!